One day back in 2012 I got an email from my friend Monica Choy, inviting me to participate in a group show. She was sending several artists small blank hand-made accordion books, asking that we keep them as sketchbooks for a month and then send them back to be shown in the show at Hellion Gallery in Portland (I was living in Minneapolis at the time). After one or two false starts I ended up doing a long, continuous landscape drawing, depicting a chase scene unfolding through the landscape, populated with weird flowers and colored boxes. I was about to publish Rage of Poseidon at the time, also an accordion, and was interested in exploring the form a little more. I got into it enough that I ended up attaching a couple extra feet of paper to extend the scene. The piece ended up having resonance in my other work for the next several years. The fantastical plant forms, and the idea of a long continuous landscape are recapitulated in A Walk in Eden, the coloring book I did in 2016. And the characters and the boxes feed pretty directly into Tongues. In retrospect I think of the piece as a sort of ‘proto-prequel’ to that book both visually and thematically. 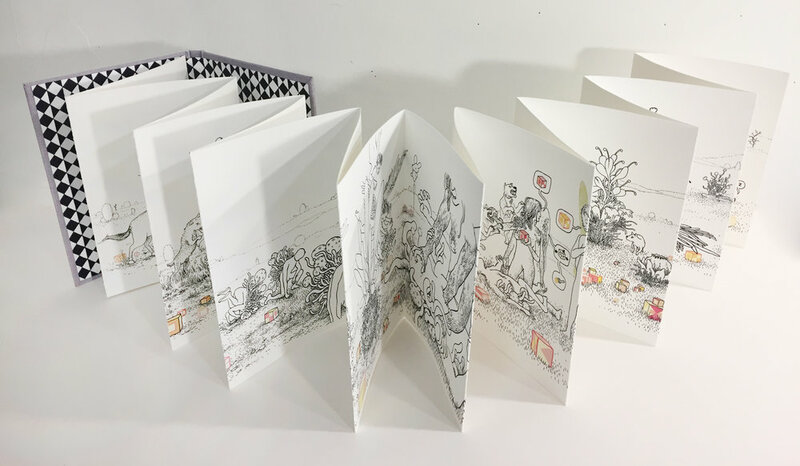 The original piece was later shown in Minneapolis in a book-arts-and-comics exhibition called The Book in Extremis at MCAD during the PFC residency in 2015, and again at the Art Gallery of Western Australia in Perth in their Comic Tragics show in 2015. Showing the original as an object or as a drawing was great, but I’ve wanted to figure out a way to publish it ever since the Hellion show. That was easier said than done. Printing and folding a seven foot long accordion is not a simple or cheap proposition. And figuring out a good binding is even less so. I played with various ideas and prototypes over the years and taught myself some rudimentary bookbinding techniques, eventually settling on a more or less workable compromise. And so now it’s available. It just went up on the shop page, here. As the listing says, the project comes in three signed and numbered (or lettered) editions at different prices. There is an unbound edition of 100 (left); a numbered edition of 45 bound in salmon-colored book-cloth with a screenprinted cover (middle); and there is a lettered edition (15 copies, lettered A-O) bound in violet-gray bookcloth with screenprinted covers (right). These will each have an extra ‘page’ at the end of the sequence, hand-drawn by me, unique to each copy.